EnzymedicaDigest Gold Plus probiotic supplement is a combination product of digestive enzymes and probiotics. This formula mixture is designed to ease symptoms of bloating, indigestion, intestinal gas and irregularity (constipation). The probiotics in this supplement formula supports healthy bacteria microflora in the gut that improves the immune system and helps in the production of vitamins B, and K. Probiotics also help with constipation symptoms and support the digestion of carbs, fat, fiber and protein. Enzymedica Digest Gold+ also contains amylase, protease, lipase, ceullulase and other digestive enzymes that process carbohydrates, fats, fiber and protein. Enzyme supplementation is beneficial due to the amount of processed foods in the diet that require additional enzyme action for digestion. Each serving provides 500 million probiotic bacteria, including Bacillus Subtilis, L. Rhamnosus, L. Casei, L. Acidophilus, L. Plantarum, L. Bulgaricus, L. Salivarius, and L. Paracasei. According to the manufacturers, “Digest Gold + Probiotics provides complete digestive care in the convenience of a single capsule dose.” This product is vegan-friendly, kosher, certified non-GMO and gluten free. 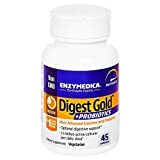 In addition to Digest Gold, Enzymedica also sells a number of other probiotic and digestive supplements including Digest Basic, Digest Spectrum, Pro-Bio, Digest Complete, Enzyme Defense Extra Strength, Candidase, Lipo Gold, pH-Basic and Enzymedica Lacto. The Digest Gold Plus Probiotics formula includes 13 digestive enzymes in a Thera-Blend formula. These enzymes help to break down large molecules in foods into their smaller components so they can be used by the body. When foods are properly broken down, this aids in nutrient absorption so that needed compounds in these foods are taken up from the intestines. Digestive enzymes are also being researched for their effects on inflammation in the gut, irritation of the intestinal lining and on Leaky Gut Syndrome. These enzymes are also being studied as a means to allow a more varied diet in Celiac disease patients who must currently eat a restricted non-gluten diet. Individuals with IBS and IBD may also benefit from using supplements with digestive enzymes to reduce symptoms of gas, constipation, diarrhea, bloating and indigestion. Probiotics also play an important role in digestive function and in maintaining overall health. Probiotics refer to the beneficial bacterial organisms that colonize your mouth, gut, colon and the female urogenital tract. Not only do probiotic microorganisms break down food, they also produce lactic acid and other anti-bacterial substances that prevent bad bacteria from growing and disrupting digestive function. Harmful bacteria can cause inflammation, irritation, diarrhea and result in more serious infections and diseases. While bad bacteria will always exist in the gastrointestinal tract in some number, it is important to maintain the right ratio of good probiotics to bad pathogenic bacteria. Digest Gold+ contains 500 million CFU’s (Colony Forming Units) of Lactobacillus rhamnosus, Lactobacillus acidophilus DDS-1, Lactobacillus plantarum, Lactobacillus bulgaricus, Lactobacillus casei, L. gasseri, L. salivarius, and L. paracasei. This probiotic formula is promoted to help with dermatitis, lactose intolerance, stool regularity and helps boosts the immune system to resist colds. The product has received good review by customers on Amazon for the conditions of acid reflux and IBS (Irritable Bowel Syndrome). The dosage of probiotic bacteria in this supplement is relatively low compared to other products on the market. It may be effective for maintaining digestive health, but might not provide a sufficient number of probiotic CFUs to address certain health conditions. Digest Gold + Probiotics gas received a 4.6 out of 5-star review on Amazon.com, based on 222 current user reviews. It is currently rated as #619 in the category of digestive enzyme supplements and #2851 in the category of digestive supplements. According to user reviews, this supplement is helpful for digestive distress caused by spicy or greasy foods, alcohol and sweets. Users have also said it is effective for acid reflux and helps to reduce gas, bloating and more. One user noted that they experienced better results with Enzymedica’s Digest Gold supplement without the probiotics. The user stated that taking this supplement with probiotics included resulted in more bloating and gas than the version without the added microorganisms. Probiotics and digestive enzymes are both considered safe when used appropriately. Mild side effects can occur, including a worsening of gas, bloating, diarrhea or abdominal discomfort when first taking probiotic supplements. These symptoms generally disappear after using a probiotic for a few days. Women who are pregnant or nursing need to check with a doctor before using Enzymedica Digest Gold +Probiotics. Probiotics should be avoided by those with immune impaired conditions such as organ donors and those on immune depressive medications. People with Short Bowel Syndrome (SBS) and those using catheters should also avoid using probiotics. This product does not contain dairy and may be appropriate for lactose intolerant individuals. Probiotics do interact with antibiotics and they need to be taken at least two hours apart from each other to prevent probiotics from losing their efficacy. Digest Gold Plus Probiotics is a good choice for those who have problems digesting certain foods. While the number of probiotic CFUs provided by this supplement is lower than other probiotics, the digestive enzymes in this supplement are reported to help with symptoms of digestive discomfort. de Castro, AM, Multivariate optimization and supplementation strategies for the simultaneous production of amylases, cellulases, xylanases, and proteases by Aspergillus awamori under solid-state fermentation conditions., Appl Biochem Biotechnol, 2015 Feb;175(3):1588-602. doi: 10.1007/s12010-014-1368-2. Epub 2014 Nov 21.
de Castro, AM, Multiresponse Optimization of Inoculum Conditions for the Production of Amylases and Proteases by Aspergillus awamori in Solid-State Fermentation of Babassu Cake. Enzyme Res, 2011;2011:457392. doi: 10.4061/2011/457392. Epub 2011 Sep 11. Esteban, MA, Effect of dietary supplementation of probiotics and palm fruits extracts on the antioxidant enzyme gene expression in the mucosae of gilthead seabream (Sparus aurata L.). Fish Shellfish Immunol, 2014 Aug;39(2):532-40. doi: 10.1016/j.fsi.2014.06.012. Epub 2014 Jun 18. Kaukinen, K., Novel treatments for celiac disease: glutenases and beyond. Dig Dis, 2015;33(2):277-81. doi: 10.1159/000369536. Epub 2015 Apr 22. Schuppan, D., Celiac disease: from pathogenesis to novel therapies. Gastroenterology, 2009 Dec;137(6):1912-33. doi: 10.1053/j.gastro.2009.09.008. Epub 2009 Sep 18.